Partners from Flintshire County Council have visited our Holywell site and declared the works officially underway! Holywell Extra Care will be Flintshire’s fourth extra care scheme, and the third of which we have the pride in constructing. Holywell Extra Care is being provided by developers Wales & West Housing in partnership with Flintshire Council. This project, on the site formerly occupied by Ysgol Perth y Terfyn, will house a 55 unit apartment complex with 24 hour care and support available. 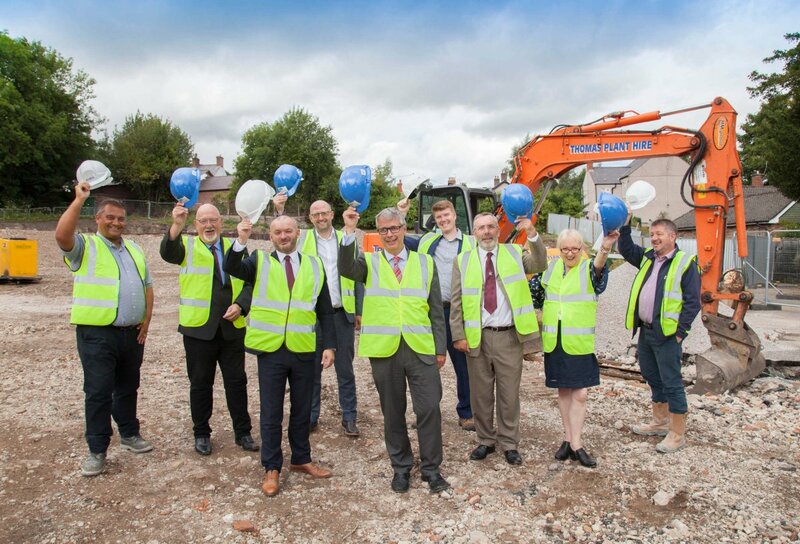 Members from Flintshire Council have visited site along with development managers from Wales & West Housing to observe the early progress and to officially see works commenced. “We are delighted to be involved with Wales & West Housing and Flintshire County Council on what is a very significant development for Holywell. “The new Extra Care facility will provide high quality facilities for the area and bring a solution to independent living. On a major project like this, we always aim to use local contractors and suppliers to ensure important employment opportunities are brought into fruition, this also includes apprenticeships and work experience placements, and in-turn provides an investment in the area’s economy. We’re thrilled that the site has been officially opened by our partners and we’re looking forward to seeing the project develop.